King’s X have announced that they have begun work on a new album—their first in over a decade. The still-untitled record is scheduled to be released later in 2019 via Australia's Golden Robot Records. The Texas trio today revealed that they’ve entered Blacksound Studio in Pasadena, California, with producer Michael Parnin (Rage Against the Machine, Missy Elliott). 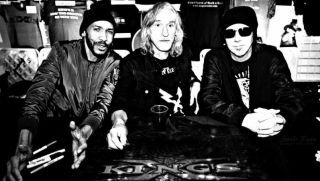 Commenting on how it feels to be returning to the studio after 10 years, King’s X bassist and singer dUg Pinnick said: "Good question! I haven't thought about it much, been super busy, but [I've] got a ton of tunes to submit. I never know what to expect. I'm always surprised when it's done and can see it as a whole picture. And we're making a record after how long? I've been waiting for this to happen for a very long time, and I'm totally looking forward to it." Added drummer Jerry Gaskill: "It's been a while since we've made a record together. I go back and forth between excitement and fear. But when it gets right down to it, I think excitement wins. I look forward to sharing all of our ideas together and seeing what comes of it all. If nothing else, it will be the next King’s X record." Said guitarist Ty Tabor: "I'm excited to see where we are at these days. We're all bringing ideas in." The upcoming album will be King’s X’s first studio effort since 2008’s XV. For more information, head over to KingsXRocks.com.